The Bachmann Consolidation 2-8-0 was new at the 1975 Chicago Hobby Show. 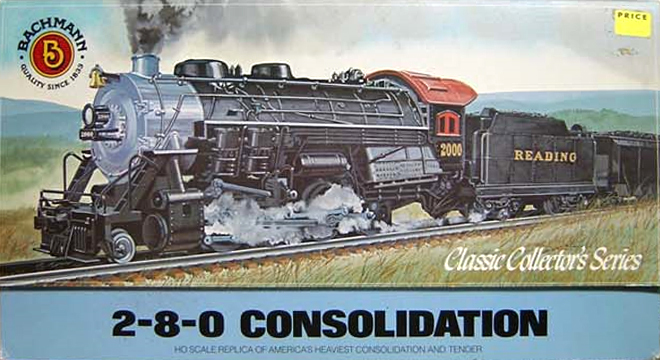 Bachmann's second HO-scale steam locomotive was this Consolidation 2-8-0. The model had a die-cast chassis and eight-wheel drive mechanism. The model had a $40 retail by the late 1970s. Great Northern was added in 1976 to the original Reading and Santa Fe road names. This model moves to Bachmann's Plus series in 1992. The gray boxed Bachmann Plus 2-8-0 Consolidation retailed for $79.95 and included the three road names (Great Northern, Reading, and Santa Fe) from the standard line release.